Jayme is planning to ride across the United States from the Canadian to the Mexican border along the Continental Divide. Concho - a fourteen year-old registered Morgan gelding. Morgans are known for strength, endurance, and excellent feet and legs. Jayme tells us that Concho is an amazing athlete; fast, quick, and climbs hills as if a mountain goat. Big Mama - described by Jayme as a beautiful registered six year-old sorrel mammoth mule with strength, athleticism, and a troublesome streak. Snuffy is "a compliant mule, never intentionally doing wrong - but he's a mule and can find unintended trouble)." Woof - a very friendly stock dog from a shelter. She will keep watch for wolves, grizzly bears, and menacing people. Have a safe and happy journey, Jayme! Over 800 miles of difficult terrain, neither bears, snowstorms, downed timber, or horse wrecks slowed our trip. Then came the U.S. government. I have been home in Jackson Hole for 1.5 weeks awaiting a permit to enter Yellowstone Park. I departed the Canadian border on May 11 and chased the Continental Divide through Montana and Idaho, arriving at the Wyoming border on June 20, more than two weeks ahead of schedule, only to have my horses denied entry into the park because of "bear closures." I reckon the Park folk thought I'd not been through any bear-laden places, that a person is safer hiking than on stock. Regardless, I was forced to leave my horses outside the park and return home to wait. I now have permit and depart again tomorrow, my precious, hard-earned two week schedule gain wiped clean. In all honesty, the trip so far has been a trial, one long string of harrowing and difficult experiences. I never expected my trip to be a joy ride, but by most measures, it has been anything but. Only five days out of 40 were without snow, rain, and/or hail. We've been off an on the Divide, having to ride around several sections of the Continental Divide Trail that are still deep in snow. Now the weather seems to be improving and I hope the going will get a bit easier. Because bad weather necessitated several alternate routes, I've already failed in my attempt to ride the entire Continental Divide Trail in one season. So I've decided to slow down and focus more on enjoying myself. I may ride all the way to Mexico or may not, but regardless of how far I go, I'll be able to say I savored the experience. Despite near drownings, nasty falls, constant downfall, rattlesnakes, and sparse grass, my horse and mules haven't had a single lame day. They are holding their weights. For that I'm grateful. I've lost 18 pounds and am exhausted but healthy. Dog Woof is having the time of her life. 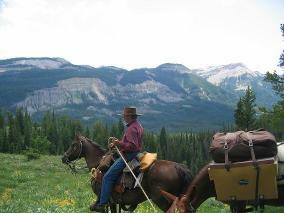 I depart tomorrow 7/2 across Yellowstone and Wyoming, heading south along the Continental Divide. So I cannot ask for more. Despite the difficulties, we are all healthy and able to continue. And that alone is a victory. Please click here to go to Jayme's website. Jayme wrote a charming poem about the Abernathy Boys, everybody's favourite little Long Riders! Please click here to read it.